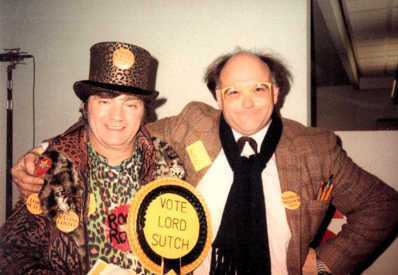 Officially appointed Minister of Inventions for the Monster Raving Loony Party by the late Screaming Lord Sutch. John Ward created the party's Manifesto Muncher which turned other political parties' manifestos into toilet rolls. Too many to remember, including Radio 4s Start The Week and Midweek With Libby Purves, Radio 1s Newsround, plus various BBC local stations, various independent radio stations plus numerous interviews for various foreign stations - both recorded and live items. due to syndication, untold other publications sometimes come to Johns notice because of researchers phoning up after spotting mentions of him in them. He has been repeatedly used by Syndicated News Features (UK) and Gamma Press Bureau (France) who supply 3,000 client publications worldwide.